Undecided between a monohull and a catamaran? Consider a side by side comparison. Send three days aboard our luxury Catana 582 Mariah, and three days aboard a comparable Ron Holland 80ft monohull Lady-A. 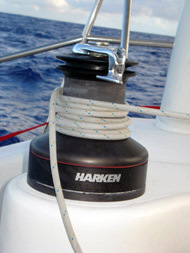 This combination allows sailing in similar waters, with a similar rig for side by side comparisons. Ever sail along thinking "what would a cat do in this water" or "would a mono hull be more comfortable today?" Wonder no more. In less than an hour we can have both boats in open water experiencing the sea swell. Feel the motion, and make your decision based on information. 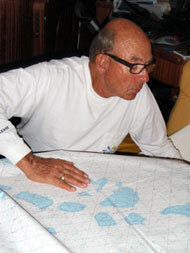 We think when viewed side by side we will be able to help you make a competent decision on your future sailboat style. We provide you the perfect opportunity to master your offshore sailing skills in a safe and secure environment while learning the art of “leaving a clean wake”. 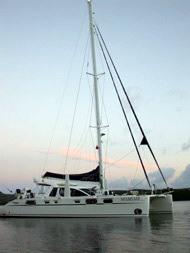 A catamaran voyage is more than a catamaran rental. Considering making the switch to a catamaran? Want to build sailing confidence? 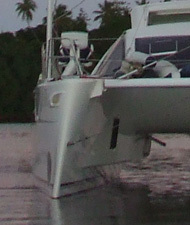 Want to buy a catamaran? Curious about what a stress free sea passage could be like? Take a sailing trip aboard Mariah, a luxury Catana 582 and see what a catamaran voyage could be like. 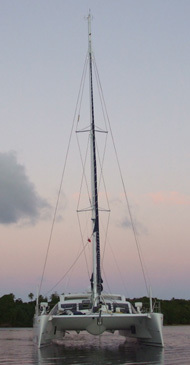 Scott Fratcher and Allison Thompson are lifelong cruising sailors and key members of Team Earthrace (holder of the round the world circumnavigation record). 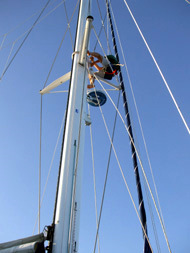 We use our 58ft magnificent Catana 582 catamaran as a training ground to help tune the skills of sailors the world over. Weather your skills are beginning or expert spending a week or a month sailing with our experienced team will help hone your skills and help build confidence. We specialize in teaching families the skills of working as a team. All other activities that help keep the vessel safe while on passage. "We make any sail into an adventure"
Surrounding Tonga are many beautiful islands that can be reached by a short catamaran ocean passage. Most times we need to book our Catana 582 for two weeks minimum to reach the surrounding islands and the voyages are weather dependent, but the options are nearly endless. For example Western Samoa with its beautiful culture and history is just 36 hours to the north, while American Soma directly next door is an example of America’s largest fishing port and one of America’s largest national parks. Just 24 hours north is Niuatoputapu, often considered the “most authentic” and untouched of the Tongan islands. Rarely visited the friendly yet isolated people await your arrival. Note-The population of Niuatoputapu is extremely isolated and have almost no ferry or delivery service from the outside world, thus when visiting we tend to carry mail, food, and other supplies to be delivered to the island population. This kindness greatly helps our acceptance normally resulting in a party feast thrown in honor of the boat. To the east is the small country of Niue, one of the world’s smallest countries with a population of only 1400. The idyllic harbor, world class dancing and limestone cave formations are known throughout the Pacific. South of Vava’u is the capital of Tonga, Nuka’alofa on the island of Tongatapu. For trips longer than two weeks, and depending on the route chosen we are able to pick up or drop off in the capital saving the short forty minute inter-island plane hop to Vava’u. For those wishing an adventurous open ocean fishing expedition we are able to travel to the Durham Shoals. Located directly on the top edge of the Tongan trench with depths varying from over five miles deep and shoals that poke to the surface covering over a 150 miles. The Durham Shoals provide some of the world’s best open water fishing with big game continually circling in search of the steady food source provided by the endless swirling underwater currents. Remote islands such as Tafahi, Niuatoputapu, Niuafo’ou, and Nuie are on our charter route for a real sail adventure. All you have to do is ask. There are many other seamounts (underwater volcanoes that rise to near the surface-perfect for deep sea fishing). We are able to visit these remote and nearly “untouchable” in comfort for your pleasure. Are on our yearly sailing route. We can arrange diving, or fishing expeditions to these inaccessible, isolated locations. Suwarrow (Suvorov) was a stop on our last expedition of the Pacific and it turned out to be a high point of the journey. "Come have a sailing yacht vacation aboard our Catana 582, Mariah"